The SNP has won the largest share of the European election vote in Scotland for the first time, beating Labour into second place. 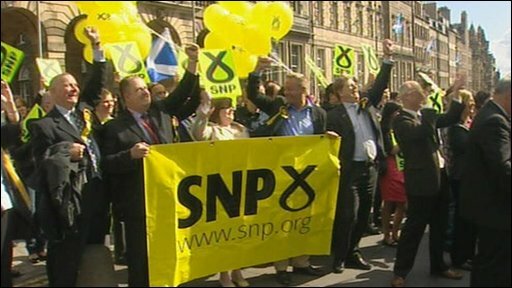 The SNP took 29.1% of the vote - a 10 point increase from the 2004 election - ahead of Labour's 20.8%. The Tories took 16.8% and the Lib Dems, 11.5%. The result means the SNP and Labour have returned two MEPs each, with one each for the Tories and Lib Dems. Scottish First Minister Alex Salmond hailed the result as "historic". At UK level, Labour suffered its worst post-war election result as it was beaten into third place by UKIP. Not sure I entirely buy the SNP argument that this was a confidence vote in the Scottish Government. It was more about protest against Labour. However, at the very least, the voters were not apparently deterred in any way from giving their support to the SNP by the party's performance at Holyrood. Plus the victory for the SNP was comprehensive. Its share of the vote at the European elections was just 15.3%. The results have sent shockwaves through UK politics and led to renewed calls for Gordon Brown to quit as PM. In Scotland, the voting breakdown saw the SNP coming first in 22 of the 32 council areas, the Tories in four, and Labour and the Liberal Democrats in three each. The Nationalists came first in Edinburgh, with the Tories second and Labour third, while Labour came out on top in its traditional Glasgow stronghold with 30.7% of the vote, and the SNP second, on 27.9%. The SNP and Labour were tied in West Dunbartonshire, each taking a 32% share, while the vote in Fife - where Gordon Brown serves as an MP - saw the SNP coming a close second to Labour. And the Tories were first in East Renfrewshire - the area which covers the Westminster seat held by Scottish Secretary Jim Murphy - with the SNP second and Labour third. Mr Murphy described Labour's election showing as "rubbish". Mr Salmond said: "This is a historic result for the SNP - up 10 points from the last European election - and the first time we have ever won a UK-wide election in Scotland, with a much greater margin of victory than even the Holyrood win two years ago. "In the contest between two governments - the SNP in Scotland, and Labour at Westminster - the people of Scotland have delivered a massive vote of confidence in the SNP Government, and a massive rejection of Labour." David Martin, who was again returned as a Labour MEP in Scotland, said the result was not the breakthrough the SNP had hoped for - and also hit out at his own party. "I think it is appalling that, during election week, senior members of the Labour party chose to walk out of government, criticise the prime minister and generally undermine our campaign," said Mr Martin. "I just don't think that shows respect for the candidates we had up and down the country - or respect for the ordinary Labour party members who were out knocking on doors." Willie Rennie, the Liberal Democrat MP for Dunfermline and West Fife, said he was "pretty pleased" with the result. He said: "In European elections, we don't tend to do as well as we do in other elections like locals or the general. But this time we've held up our vote." Shadow Scottish Secretary David Mundell, said: "I'm particularly pleased that we've polled very well in the areas that we need to win additional seats at Westminster - East Renfrewshire, Dumfries and Galloway, the Borders and seats like Edinburgh South." Mr Martin will be joined by party colleague Catherine Stihler in the European Parliament, as well as Ian Hudghton and Alyn Smith of the SNP and the Tories' Struan Stevenson - all of whom have previously served as MEPs. 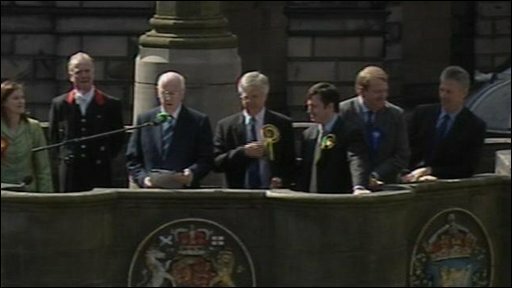 The former MSP and Scottish minister George Lyon, who lost his seat in the 2007 Holyrood election, was returned as Scotland's sole Liberal Democrat MEP. Scotland returned one fewer MEP than in the last parliament. Voter turnout in Scotland stood at 28.6%, while there were 4,490 rejected papers.